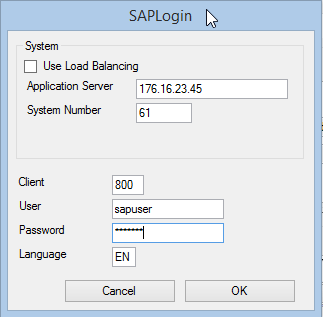 Enter the required SAP system language. This does not affect the import of the scale settings. Use this button to retrieve the list of work centers. Select the EWM scale. The scale will be selected automatically if there is a work centre where the Terminal Name matches the hostname of the current PC. Enter the search pattern and press ENTER or click again to search for a scale. When creating a Work Centre in EWM, the hostname of the PC that the operator uses when weighing, should be entered in the Terminal Name field. The hostname entered should exactly match the hostname of the PC and is cAsE sEnSiTiVe.